Preheat oven to 375°F. Lightly mist 2, 18 cup mini muffin pans with spray. Unfold the pastry sheets on a lightly floured surface. Roll each into an 18x9 in rectangle then cut each into 18 squares. Press squares into muffin pan cups and prick centers with fork. Bake 10 minutes or until pastries are golden brown. Using the back of a spoon, press down centers of hot pastries to make a small indentation. Allow pastry cups to cool in pan 5 minutes. Remove cups from pan and allow to cool completely on wire rack. Gently heat jam in a small saucepan until barely warmed through and smooth. Jam should not be hot. Combine jam and Mascarpone cheese in a large mixing bowl. Gently fold in whipped cream until there are no streaks. 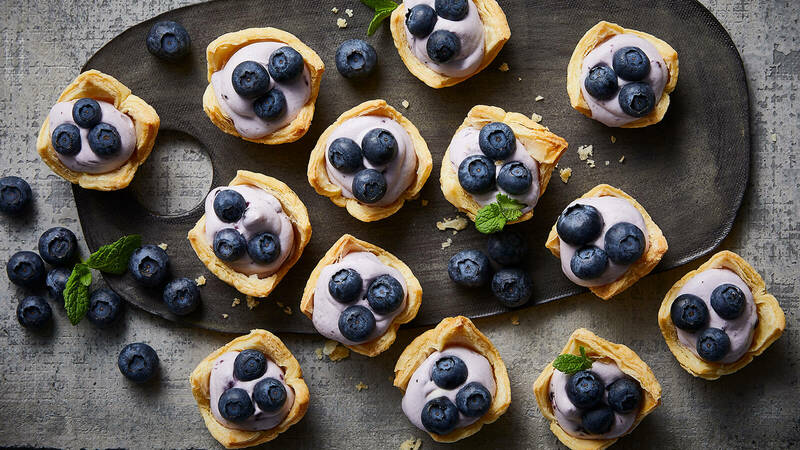 Fill each pastry cup with blueberry filling. This can be done using a pastry bag fitted with a large tip or simply dolloped with a spoon. Garnish with fresh blueberries and serve.